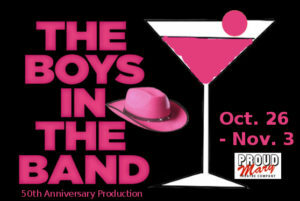 The award-winning PROUD MARY THEATRE COMPANY is now casting for THE BOYS IN THE BAND. AUDITIONS: Monday, Sept. 10, 7-9 p.m.
All rehearsals SUNDAYS-THURSDAYS will be at the West Main Artists Co-Operative in Spartanburg. No monologues, please. You will read from the script. MICHAEL – 30, average face, smartly groomed. DONALD – 28, medium blond, wholesome American good looks. EMORY – 33, small, frail, very plain. LARRY – 29 with a starkly simple sense of individual style and color in his clothes. Dark eyes, dark hair, extremely handsome. HANK – 32, tall, solid, athletic, attractive. BERNARD – 28, African-American, tall, gaunt, nice-looking, dressed in Ive-League clothes. COWBOY – 22, light blond, muscle-bound, too pretty. HAROLD – 32, dark, lean, strong limbs, unusual face. ALAN – 30, aristocratic Anglo-Saxon features. In his Upper East Side apartment, Michael is throwing a birthday party for Harold, a self-avowed “thirty-two-year-old, pockmarked, Jew fairy,” complete with surprise gift: “Cowboy,” a street hustler. As the evening wears on – fueled by drugs and alcohol – bitter, unresolved resentments among the guests come to light when a game of “Truth” goes terribly wrong. This groundbreaking play premiered Off-Broadway in 1968 and ran for 1,001 performances. It was subsequently made into a feature film with the original cast, directed by Academy Award-winner William Friedkin (“The Exorcist”). Questions? Please call John Fagan at (864) 787-4016 or Sandy Staggs at (864) 787-4016.